This debut novel is a breath of fresh air in a world gone mad. I enjoyed smiling and laughing at the adventures/misadventures of Cyd Redondo so much. There are characters that one falls in love with immediately, and Cyd is such a character. She has a knack for bargains and smart deals, the ability to live with an extended family who is overprotective, and the compassion to take care of those she loves and serves. I always appreciate clever with humor, and Wendall Thomas achieves that not only in the witty dialogue, but the mishaps and situations that Cyd experiences are so hilariously unique to anything else I’ve read that I applaud the outstanding creativity of this story. 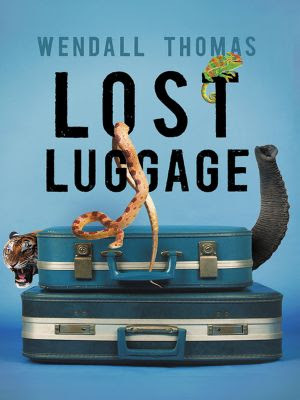 Lost Luggage is Thompson’s first novel, and she already has a tight grasp on dialogue, plot, and characters. Cyd is, of course, the main character and has my vote for one of the best new characters in mystery/crime, but there are other great characters in this wonderfully bizarre book whom the author delights the reader with, from Brooklyn to Tanzania. And, talk about setting. The close Brooklyn community in which Cyd has spent her whole 32 years is a comfort place for sure, and when we get to Africa, the world opens up for the reader as well as for Cyd. “Hi, I’m Cyd Redondo, Redondo Travel” is Cyd Redondo’s calling card when she meets someone, as she is always promoting her family business. She has spent her 32 years with her extended family, living with them and working with them. She is a travel agent who has not traveled outside her immediate Brooklyn neighborhood, but she is good at her job nonetheless. When Cyd has a chance to travel to Tanzania, Africa in a travel agent contest, she decides it’s time for her to get some miles under her passport. It’s also time to get away from the bad business in the pet shop next door to the Redondo Travel Agency, that of one dead octogenarian named Mrs. Barsky, mysteriously murdered after a couple of break-ins occur. Add in the bonus of Mrs. Barsky’s son living in Africa and needing to be notified of his mother’s death, and the trip seems meant to be. Going against her Uncle Ray’s wishes, Cyd attends a travel agents’ convention in Atlantic City to try and boost her bookings for the Tanzania trip. She is determined to book enough trips to win a trip there for herself, and she’s already tapped out most of the Brooklyn senior citizens her uncle’s agency specializes in. She doesn’t have much luck in the trip prospects at the conference, but she does meet a romantic prospect, who comes to her aid when she is having words with a particularly annoying travel agent, who is also from her Brooklyn territory. And, as luck would have it, Roger shows up at her house where the extended family of Redondos live, just as the Tanzania trip falls into her lap from enough bookings. Uncle Ray wants to cash in the trip, but Cyd has worked too hard to be denied this reward, so she grabs Roger as her plus-one for the trip and makes her escape. Upon arrival in Tanzania, and after being informed her luggage has been lost, Cyd is shocked to learn that two of her senior citizen clients are in jail. It may be the first foreign country Cyd has ever been to, besides New Jersey, but this is one travel agent with who knows how to connect with the people she serves and adapt to resources available. It’s not easy, but Cyd manages to spring the couple from jail only to learn before their departure that animal smugglers have targeted the older couple’s luggage for carrying their contraband of baby turtles, parrots, snakes, and poison frogs. So starts Cyd’s introduction to the ugly side of exotic animals and their illegal entry into the United States. As problems seem to keep adding up and Cyd and Roger get deeper into the dangerous world of illegal trade, Cyd begins to wonder if the country she couldn’t wait to get to is ever going to let her go. Wendall Thomas has created a laugh a minute tale that still manages to touch upon a serious subject. It’s said that a comedian depends upon timing for a successful joke. Well, Thomas has mastered the timing for Cyd’s misadventures, giving readers a delightful journey through the wilds of Tanzania in Cyd Redondo style. I can hardly wait to see what comes next for this plucky travel agent/amateur sleuth.